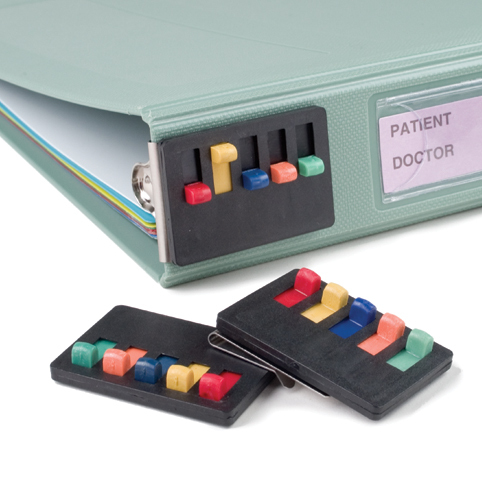 Essential supplies to simplify patient charting systems. All Charts & Carts accessories are designed to improve efficiency by helping you creating a more organized charting system. Essentials include sheet lifters, chart flags, spine alert signals and a multitude of other charting products. Contact the charting experts and Charts & Carts for personal assistance in choosing the best accessories to compliment your charting system. SKU # WD-1560, Great for point-of-care nursing! SKU # MHP-800, Ideal for nursing stations and other medical related areas. Sheet lifters make documents in your chart binder easier to manage. SKU # FAS-1400 Flag Alert Series - Over 50 stock titles!